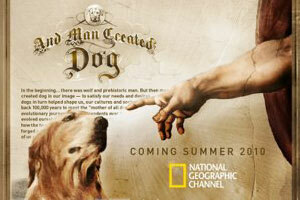 Evergreen Films trusted me with their new release for the Nat Geo channel called “And Man Created Dog”. They were short on time and gave me 3 weeks to score 96 minutes of show !! It was a rush, but with the help of my old compadre, composer Guy Thomas we came in a little ahead of schedule !! The show explores the domestication of dogs from wolves. It uncovers the unique symbiotic relationship between man and dog and the amazing evolution of our “best friend”. I dedicate the entire score to the canine love of my life. my dear sweet dog of my dreams, “Kaela”, an Aussie Sheperd who has filled my life with warmth and affection ! The show begins airing on the National Geographic Channel August 8th ! !